Thus begins the chain of events that bring together Captain Richard Phillips (Tom Hanks) and Muse (Barkhad Abdi) in Paul Greengrass’ depiction of the hijacking of the Maersk Alabama in April 2009 – the first such seizure of an American vessel since the early 19th century. Most viewers will know Greengrass for his work with Maaattt Daaaamon (the latter two Bourne films and Green Zone) and Captain Phillips is reminiscent of his earlier films in its use of vivid colour, snappy editing and jumpy, dizzying camerawork. Every bump and roll of Muse’s skiff is felt as his band of pirates approaches the Alabama. The cramped conditions of the ship’s living quarters, narrow corridors and the all-important lifeboat is emphasized by getting up-close-and-personal with the characters, a fluid and constantly moving camera and purposefully imperfect framing. For those who think Jack Sparrow or of Dodgeball’s Steve when asked of pirates, this will be a rude awakening to the realities of the modern highwaymen of the high seas. They do not ride in majestic galleons, have neither wooden legs nor eye patches and there is not a parrot to be seen. And this film seems to suggest they do not do this because they want to; there is no romance or adventure to their venture. It is “just business” as Muse says to Phillips upon first meeting him. Muse proudly tells Phillips (or “Irish” as he is nicknamed) that he took a Greek ship the previous year and made $6 million dollars in ransom. Why then is he still dressed in rags and taking to the sea in a broken-down fishing boat? Like Phillips, Muse also has bosses to answer to but unlike the Captain who reports to “the union” and other superiors, his are Somali warlords. 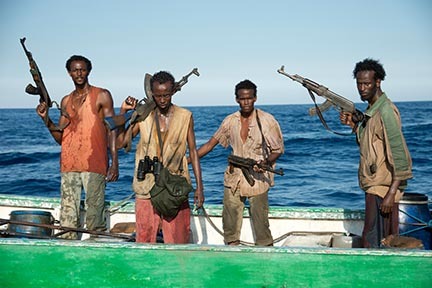 In a moment of relative calm, Muse tells ‘Irish’ that in Somalia you can either be a fisherman or a pirate. Perhaps “in America” there would be greater opportunities open to him – the age old ‘American Dream’ which still exists in the minds of some. As much as we side with Phillips and his plight, it is impossible not to have a small amount of sympathy for Muse and his band of not-so-merry men. He laments the pillaging of fish from Somali waters by rich countries, leaving nothing for his fellow fishermen. He endangers the life of Phillips by kidnapping him but puts his own life in danger if he is unable to provide ransom money to those who call the shots. We are never quite sure who has the upper hand. It is an interesting conundrum that plays out until the dramatic conclusion. Films based upon true events can sometimes lack the intrigue and excitement of fiction. To reference another film on a big boat – why are people still so obsessed by the Titanic? The boat hit an iceberg and a lot of people died. How much more can be said about it? Greengrass took a story from only a few years ago and ensures that his film is suspenseful, edge-of-your-seat stuff until its final shots. Posted in 2013, British Directors, Oscars and tagged Paul Greengrass, Tom Hanks. Bookmark the permalink.